The iPod Touch has long been referred to as the iPhone with out the phone, but to me it was also the iPhone without the camera. When working for a mobile developer during the announcement of the second generation iTouch, I would have left the office that day and upgraded my first generation if it had a camera. Now I have upgraded, but there are some marked differences between the iPhone and iPod Touch now. Screen Of course, Apple is pushing their new Retina Display technology. It’s sharper and more vibrant than the older screens and is a vast improvement, without a large improvement in screen resolution with its 960 x 640 on a 3.5 inch screen. Applications The iPhone has a library of over 250,000 applications available, and all of the are compatible with the iPod Touch. Almost any type of application you can imagine is out there, and if it isn’t, someone is trying to create it. Battery Life Apple claims that the iPod Touch up to 40 hours of playing audio and 7 hours of video. Of course, this doesn’t account for things like streaming audio, using the wifi, bluetooth or any other extraneous services. Unfortunately, I haven’t fully been able to test the limits due to an unfortunate accident that made the iPod unusable for a little over a week. Camera While the iPhone and the Droid measure their camera resolution in megapixels, the iTouch is limited to VGA quality pictures at 960 x 640. While it’s not the worst thing, it would be nice to have a higher quality camera. It does record video at 720p, which makes one wonder why they were willing to put high quality video but not still pictures. And with the iMovie app, the HD videos can be edited directly on the iPod. Media Player As with any Apple product, the audio and video playback are seemless. 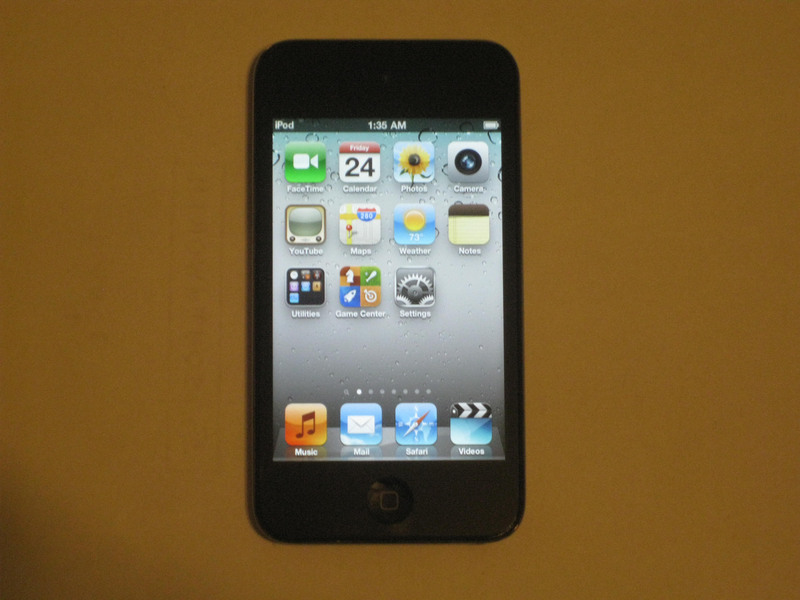 Easy to access and with a double tap of the button, iPod controls are easily accessed. Of course, I did buy it as an iPod, so the quality audio and video playback are expected. Keyboard The standard Apple iPhone onscreen keyboard is here, but I have trouble using it after the larger horizontal keys of the Droid and the much larger keys of the iPad. I know many other people complain about the iPhone/iPod keyboard, so I’m not alone in this. Email The threaded email in iOS 4 has really made it easier to read my email, especially with long email chains, but since my main email provider is Gmail, it falls a little short. I can’t manage Gmail fully from the mail client, since the labels are inaccessible, and the default to archive instead of delete is annoying (but can be changed in settings). It’s the small Gmail features that I use that make the Droid’s mail client much better for my needs. Hardware My biggest problem with the iPod is the actual physical iPod itself. It is far thinner and lighter than any previous iPod or iPhone and the back is very smooth, causing easy droppage (something I proved on a New York sidewalk). Hopefully that issue will be fixed when cases finally come out. The other issue I have is with the power button on top is hard to reach easily because of the curve of the iPod’s back. It is much easier to hit the button on top of an iPhone because it is flatter under the button. I am a big fan of Apple’s design and equipment. I own many of their products and am always amazed by the seamless transition between design and function with everything they have created in the last decade. The ease of use and the high quality of their products keep me coming back as a customer to purchase and upgrade my hardware.